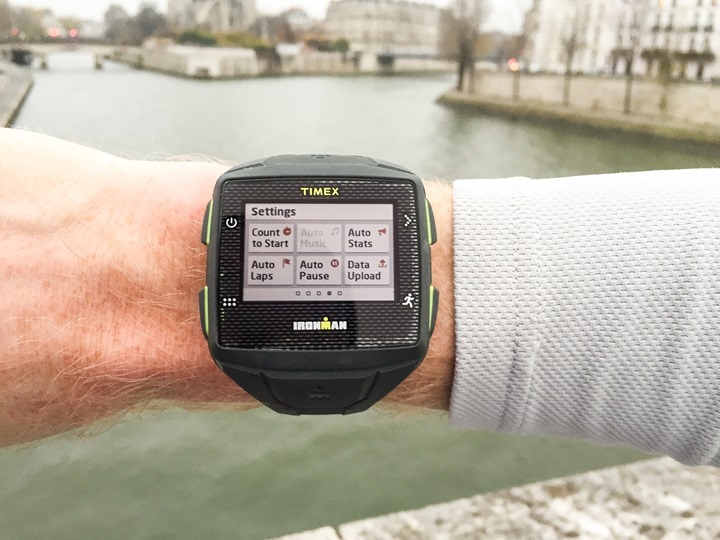 Yesterday I had the chance to go for a brief (and cold) run around the city with the Timex One GPS+ watch. This watch, announced back in August at Outdoor Retailer, contains a 3G chipset within it that enables it to connect straight to the internet and do everything from instant uploads to Strava, as well as live tracking functionality for friends and family. It also contains 4GB of storage for music playback via Bluetooth. The watch is a partnership between Timex, Qualcomm, and AT&T. Each of the companies had a pretty significant hand in it, with Qualcomm providing much of the core hardware, Timex adding in their sport expertise and finishing touches, and AT&T assisting on the connectivity front (since it directly talks to cellular networks). One of the leads from Qualcomm was in town for other meetings, and offered to head out for a run with the unit. Of course, while it’ll be launched in the US on AT&T, they’re working to establish partnerships in other countries for availability shortly thereafter. And obviously, as seen here, it works globally. For the run I was was supplied with a test unit, as well as wireless Bluetooth headphones to listen to music on. Though, since we ran together I saved the music for the end. Following the run, the unit continued its European trip with the Qualcomm individual (meaning, I didn’t get to keep it). 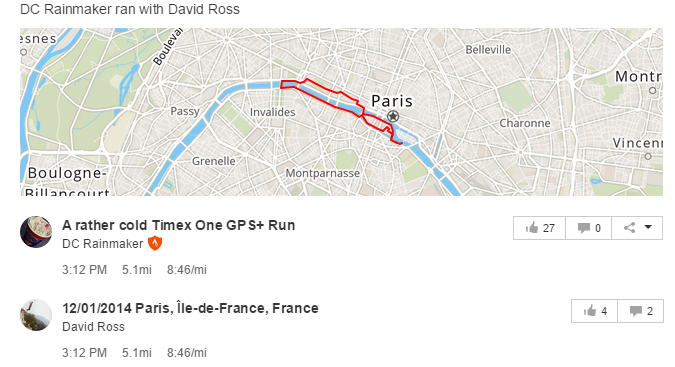 For the run I just selected a simple ~5mi route around Paris. He had just landed about 3 hours earlier from the US, so I figured a 10xMile Repeat interval workout might be a bit…rough. To get started we went outside and picked up GPS reception. It took less than 15 or so seconds for both of our watches to find GPS. In his case, he was wearing a Bluetooth Smart HR strap, though in my case I was not. The One GPS+ supports Bluetooth Smart accessories, though not ANT+. I asked about that, and he noted it wasn’t so much a case of specifically being against ANT+, but simply that when they first started development there wasn’t dual-capable chipset (which, is true, and was a major limiter on products in this segment over the past few years). So the chipset they needed for some of the Bluetooth functionality didn’t have ANT+ as well (at the time). Given it’s targeted at the running market, it’s likely less of an issue than if it were targeted at triathletes or cyclists. With GPS all ready, we tapped the start buttons and off we went. Given the chilly weather, we both had gloves on, and for the most part the screen seemed to respond to that. Not perfect, but OK. It seemed like by the end of the run I had mentally figured out the slight nuances that you find with any small form-factor touch screen and I was pretty much successful with every swipe/touch. It wasn’t raining, nor was I terribly sweaty, so it’s hard to say how that would react. During the run, the unit was configured to display standard metrics like pace, distance and time. It had three different pages setup, and I could swipe left/right to change the pages. While running we compared total distances as we went along numerous times, and the two units were pretty close to each other, ultimately ending only .03 miles apart (on 5.00 miles). I also had a FR920XT, but it was in my pocket, which would slightly impact GPS performance (and I had the Basis watch on my other wrist). During the run the pace seemed fairly stable, though we were running a bit slower than my normal running paces – so of course seeing pace stability across a broad range of paces is important. On the flip side, most GPS watches do better the faster you run, so given it was doing fairly well at the easier paces, that bodes well. At the end of the run I did get to put the wireless headphones on and give music a shot. Music is downloaded to the unit’s 4GB storage hold, and then played back wirelessly via Bluetooth. When I used the interface to change songs it seemed to respond instantly and was fairly easy to use. Of course, as I’ve seen with other units that support music – ensuring that over a longer run you don’t see connectivity dropouts is key. And that’ll be something that’ll have to wait for future tests. Upon completion, we were able to save the run and it automatically uploaded directly to his Strava account. It also published to both of his Endomondo and MapMyRun accounts. They were seemingly quite open to any other platform, via the API’s those platforms have in place to allow connectivity. For example, perhaps Sport Tracks or Training Peaks down the road if those companies are open to it. You can dig into the Strava track here (they sent me the .TCX file so I could also upload it to my account). Track-wise things actually look quite good based on where we ran. This particular route varies on the difficulty scale between easy and hard, depending on the section. Some sections, such as the run through the park – are easy as it’s largely wide open with little vertical blockage. You can see here how it very nicely tracked as I wandered around obstacles and worked our way out of the park. Yet other sections of the run are more difficult as I run through the massive stone buildings of the Louvre, into interior courtyards. Similarly, towards the end of the run I had to run inside a building to grab an item before continuing home. I didn’t bother to stop the watch, and the whole thing took probably 30-45 seconds. The cool part is that you don’t see any wonkiness in the track at that juncture. Many times when GPS units lose signal and re-gain it, they’ll use a reduced accuracy rate initially, which can result in a data point 30-100m away from the actual location. In this case, it looks entirely seamless. And, the actual track itself is within about 1-meter of where we were. Of course, it’s just one run. Sometimes devices luck out on a first run, and other times they crap the bed. That’s part of the reason I do numerous activities with devices over longer periods of time. In this case, it seemingly did quite well. In the case of the One GPS+, it’ll be a bit longer until I’m able to do more activities. They announced over the past week or so that they’re delaying the release/availability of the One GPS+ until early next year, potentially as late as spring – but ideally sooner. The reason for the delay was software focused. They noted that some of the software features simply weren’t implemented yet at the level that they deemed ready for release. While that can be frustrating for a consumer waiting for the device, it is at least promising that the company isn’t just rushing out a half-baked product in order to hit holiday sales. I think too many companies do that these days hoping that future firmware updates can fix issues. But usually the consumer suffers as the company attempts to deliver updates. Once released though, in the case of the One GPS+, future updates will automatically be delivered via 3G connectivity upon charging the watch. That 3G connectivity is bundled as part of the first year cost, and then subsequent years is $40/year, inclusive of Live Tracking and SOS (Emergency Help) features, as well as the ability to receive messages on the device. Since the run was short, I’ll keep this post short as well. You can dive into all the technical details of the watch itself, including many more photos, in my previous post from August. I cover how the unit works, and answer a ton of other questions in the comments section. Looks pretty cool. Something to give the 920xt a good fight. Just to clarify though, this is aimed at runners even though it has Ironman branding? Are there plans for a triathlon version? Correct, aimed at runners. I think they’re open to seeing how it could be expanded down the road. It is fully waterproofed though (50m), so no issues using it during a swim. How does it compare size/weight wise to the 920? I just switched to the 920 from the 620 for an everyday watch and don’t think I’d want to go any bigger. How are the navigation features? How about fitness tracker features? Built-in 3G is pretty promising, especially for a running watch where most people won’t want to take their phones. $40/year sounds pretty reasonable. It’s definitely bigger than the FR920XT. It’s sorta like a FR910XT that maybe eats the random extra cookie now and then. As for navigation and activity tracker, it wasn’t something we toughed on in our brief meeting, though, my understanding is that neither are within it today. And yup, I agree, $40/year is pretty reasonable. I have to say my first impression was “Wow that’s BIG”… which wasn’t really that clear to me from the first look photos. It isn’t surprising I guess, for the first pass at this kind of integration. At $399 (assuming they stick to that?) it seems fairly reasonable if the software side matches the 620, though I guess after something like a 5 year lifespan you’re adding a further $160 just for convenience…. it’s a tough call. I reckon I’ll be more interested when the next (smaller) generation comes out I think, but it’s good to see onboard 3G coming along. Couple of questions for the list – how long can it cope with storing data onboard for subsequent upload if you run out of 3G reception (which is surprisingly often in my local area)? Will the localised ongoing fees be actually equivalent to $40 or will the just make it £40/40 euros etc, which is a bit less attractive? when you talk to the timex guys directly they are quick to say it is not a competitor to the Garmin 9×0 due to batter life, cycling (as mentioned above), and swimming lack of functionality. It is defiantly geared to running for now. Unfortunately, with the 920XT in my pocket, the track was pretty ugly (all over the city). I didn’t quite think it would be impacted that bad sitting in there. Sorry! Prior ads and your prior article mention Runkeeper integration but you don’t mention it here. Is Runkeeper integration still on the table? My biggest concern, based on other watches in this space, the Motoactv and Adidas Smart Run, would be battery life. Did you get any feel for battery life? How much percentage did it use on the 5 mile run? I’ll double-check that Runkeeper is still on the table (or perhaps already implemented). I didn’t get a feel for battery life during the run. Thanks for this Ray. When you tried bluetooth headphones, can you comment on whether spoken updates are a feature and if you received any audio dropouts? Hmm, I’ll ask on the audio announcements, good question (I’m going to group all the questions today together and get clarifications). No audio dropouts, which is a good start. Thanks for this! After reading your earlier review, I was excited to pre-order this watch for Christmas. Then a few days ago I was surprised to receive a short, cryptic email notifying me that my order had been cancelled. No explanation given as to why. After reading your post, I understand now what’s going on. But it would have been so much better if Timex would have explained the reason for the delay in the same email they sent to nofity me of the order cancellation. I’ve sent several emails to Timex asking for an explanation but haven’t gotten any response. The watch looks great, wish I could say the same for their customer service! you know if that is the case or was it just a writer getting over excited? I dont get this watch? The biggest thing going for it is 3G support over any other garmin watch and yet all you can do with it is live track, send an emergency call and receive some “messages”? I dunno about most of you, but live tracking is usesless unless my relative need to see my position in a race (which is never), emergency calls (nice, but if it is dire I can flag someone down) and messages (not sure what this really means). Since it has 3G i was expecting live mapping or something more usefull. The newer android wear watches (like the sony smartwatch 3) have offline GPS, music playback via bluetooth (4gb) and can be exported to various apps (Runkeeper, Strava, etc…). Devs are expecting Google to open up the Bluetooth BLTE to sensors so it can read things like Mio Link or other bike sensors with BT. I don’t get why You are confused. It seem no watch is perfect and each has their own shortcomings if you look into the feature set. You seem to be pushing Sony pretty hard. It is Not a sports watch plan and simple. Actually, Greg, the biggest thing this smartwatch has going for it — from my perspective — is that it is untethered to a phone. I need a wrist device that can independently perform these tasks (play music, upload a workout to Map My Run, etc.) without being tied to a phone. Does anybody know of any other device that can do this? P.S., finally got an email response from Timex to explain the cancellation of my order. They promise to notify me via email when the device becomes available. @Don, Try Microsoft Band. GPS run doesn’t require a phone and no need to wear a chest strap for HR. And if you are in a sunny environment it will tell you UV rating! Android wear (via Sony Smartwatch 3) plays music offline, tracks steps, has offline GPS via Runkeeper & Strava. Plus it does 10x more like notifications, reminders, searches, etc… all when tethered to a phone. It has built in Wifi as well, so I am hoping upcoming updates allow it to upload to the web without your phone. Its more versatile and can be updated in soo many more ways. I see your point if you dont have your phone and need to update to the web in real time or ASAP, but the majority of the world doesnt need it uploaded right away and can wait until they are near their phone. Thanks Shamir, but it looks like Microsoft Band does require a phone to take advantage of many functions, and it doesn’t play music. I’m looking for a device that operates independently from any phone. My situation (admittedly, unique) is that I use a work-provided iPhone, so I’m limited in the apps I can use. Since I can’t put running apps or music on my iPhone, I need to have an independent device for that purpose. For me it’s a safety issue. I am often running or mountain biking alone in the woods where if something happened, there’s a good chance nobody would be coming by any time soon. Piece of mind for my wife. I often do ride/run with a SPOT. Even if it is an area with spotty cell coverage, at least they’d have a better idea where to even start looking. Riding I often do take my phone but I hate carrying it around with me running. SPOT fits in my shorts pocket. G3 watch would be even better. The only other devices, other than smart phones, that I am aware of that do or have done music plus gps with wifi upload are the Motorola Motoactv, the Adidas Smart Run, Samsung Gear S, and now the Sony Smartwatch 3. Each, however, appear to have their own serious problems. I’m currently using a Motoactv but can’t recommend it for most people as it has been discontinued, the Motorola server for it has been down for over two weeks, and many have had problems with water getting in the watch. I have mine rooted and export data via wifi to dropbox which is then synced through tapiriik.com to garmin, runkeeper, and strava. But to get to this point is difficult and means loading alternative software to the Motoactv (rooting) in order to get around Motorola. Motorola is providing absolutely no support for it. They will not even return calls on it. The Adidas Smart Run is still supported and being made so you may want to check it out. However, the reviews aren’t great and it appears to have dismal gps accuracy. Even the reviews on the Adidas website are bad. The Samsung Gear S sounds inviting, however, if you are not a Samsung android phone user, it’s useless. This is made very clear by every review of it. If you have an apple or any other smartphone other than Samsung, do not buy a Samsung Gear S. Reviews of the Sony Smartwatch 3 are clear that there are no current running applications such as Runkeeper that work with it and music will not load in playlists, etc. So until and unless the Sony Smartwatch 3 actually gets apps for running and music its near useless and clearly wouldn’t satisfy you or anyone looking at these pages. Your best bet for music while running continues to be the apple ipod shuffle. Mine is now at least 6 years old, still going strong, and a new one will only set you back $45. 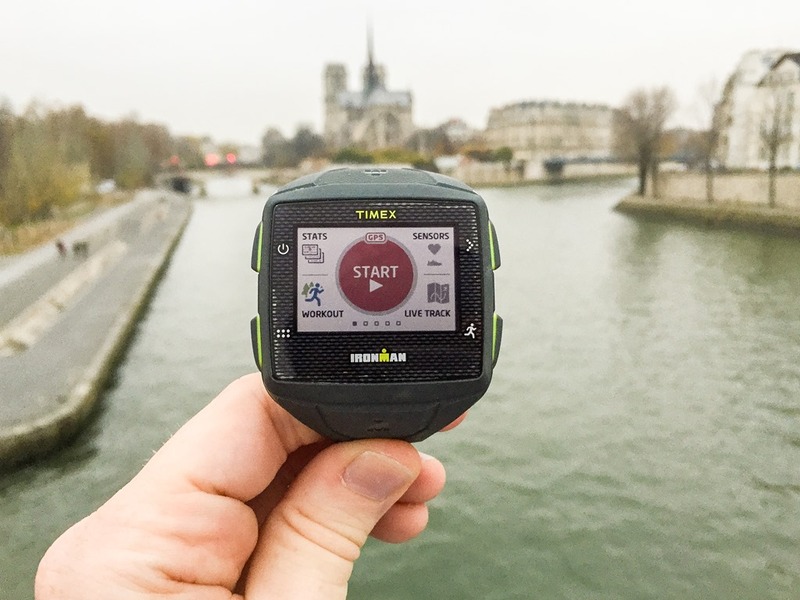 Maybe grab a Tom Tom Multi Cardio and an ipod shuffle and have only two devices to charge and keep track of for about half the price of an Adidas Smart Run or this new Timex One GPS. Just my two cents. The recent google music update fixed playlists and shuffle…you can choose between them, but it decides which to add to the watch of those downloaded. Runkeeper beta works with GPS great (ive been testing for 3 weeks and 15 runs), and should be out soon. Ghostracer works well too and the dev is looking to support mio link recording as well, which is huge! Love your website and I’m very interested in this watch, but I think we missed the mark with this article. Timex didn’t allow any in-depth analysis nor for you to keep a watch to put through the paces. This led to a fluff article on the already advertised description of the watch. Don’t get me a wrong, I’m a huge fan. But if the manufacturers aren’t going to allow you to do your thing then why give them any hype at all? I for one appreciate the hands-on test. Yes, it wasn’t a full in-depth review and DC made it clear it wasn’t. But it give some quick info that wasn’t in the other post. The watch isn’t being released for what is now another few months. So, this effectively gives folks to see what works and doesn’t work, or, where it stands in that beta process. It’s a one-shot deal. Sometimes that works out positively for a company being able to give a preview, but not as often as one might think. For example, Brim Brothers this past fall – my post then pretty much caused the stoppage of production and delay of the product. Fwiw, there was no expectation on Qualcomm’s side that I’d even post about it. In fact, they were very nervous about letting me see it at all (in fact, I suspect had Timex PR folks got involved, they wouldn’t have let me run with it). They just wanted to see if I wanted to go for a run and give them private thoughts. I figured folks would be interested in how that went and they were OK with me posting. The shortness of the post was mostly a time limitation on my part (dodging and weaving other meetings I had during the day). I know folks are generally interested in checkpoints on beta products – since that’s not often something that you can get an unbiased opinion on from a company’s blog or postings (if at all). Had the product had horrible GPS tracks, you would have seen that (the magic of automatic Strava postings). Similarly, had it had other wonkiness, I would have noted that. The challenge I have (just being completely honest) is that I can’t do in-depth reviews of every possible product on the market, especially at beta points (I simply don’t have the time to). So, I figure a quick run with a product is certainly interesting to many, at least until a product releases. Thanks for the reply and I wasn’t trying to be harsh. I really appreciate your hard work and the time you spend here. Just trying to provide some constructive feedback. Thanks again! I very much appreciate this article and update as this is/was a highly anticipated gps watch announced last August. As I pointed out above, there have been other attempts at gps with integrated music with wifi/3g upload but none entirely successful. If you run with music, this device definitely sits in a space that those that do are much interested in. Keep up the good work Ray. Great you took the time at all. We are privileged. Cancel that, I checked with the rep, I must be remembering incorrectly. It’s $40 yearly. Feel free to delete my above comment. Looks like a decent watch with some nice features, although it is ugly imo & the gui is too. Reading some comment it looks like battery life is short, so bit of a deal breaker if this is the case. Have you heard any updated release time frames? I still see value in a higher end watch for runners that want to transmit data sans phone. Hopefully Timex can execute this launch. I haven’t heard anything new. I’ll reach out and poke. Any plans for a longer review? I had to return my first one because it kept rebooting during runs! Just got a replacement, and my fingers are crossed. Like it otherwise. Yup, still plan a longer review. Cheers! So . . . just went out on a run with my replacement watch but with the same results! It rebooted twice during a short 4-mile run. Wondering if Timex is going to issue a software update/fix or something. I see elsewhere online that I’m not the only one with this issue – an issue that essentially makes the watch useless to me. Super bummed! I had very high hopes. Alex, I just bought this and having the same issues. Were you using the music app while it was rebooting? When I closed the music the watch worked fine but obviously this is an issue. Just ran with the watch in the Boston Marathon. It died, battery totally drained at mile 24.1. It did not save any of the run information post run. Going back ASAP. My wife and I were relying on the ability for her and I to communicate through text but of course that did not happen. I did not start the watch until I was in the corral with 5 minutes to the start. Was suppose to have a 8 hour battery life. Did not use bluetooth or music that could have drained the battery further or quicker. The device was left charging all night. Similar situation. Full battery charged the night before. Didn’t start the watch until gun time. Low battery warning at mile 25. Was able to finish the race and upload content before it died. Once upload was complete, watch died. No music or anything. Wore it to Boston as proof of concept but this will be more of a training/live track tool if anything. I mentioned to the Timex rep at the expo that there should be a way to access the *tcx file on the watch. If the upload fails and the watch does not acknowledge the upload failure, there is no way to recover the workout. 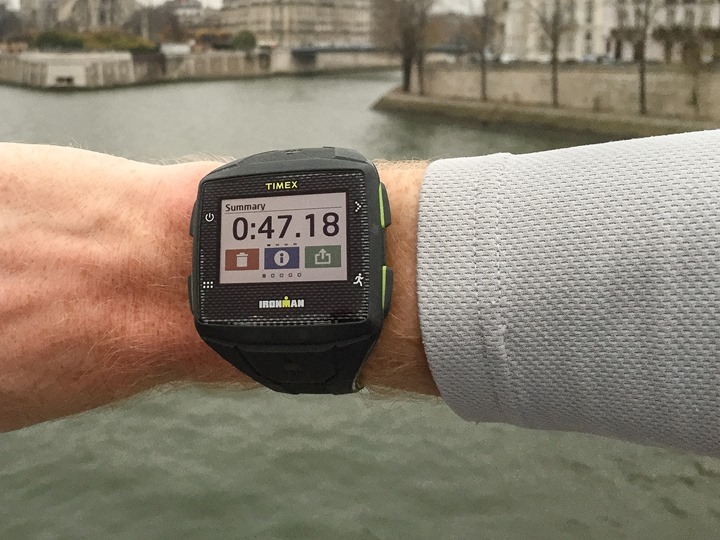 The Timex One GPS+ watch is extremely unreliable and disappointing. I have owned 3 Garmin’s and switched over to Timex several years ago after having battery issues with the 405. I loved both of my previous Timex’s and thought the One GPS+ would be just as great. However my excitement for my new Timex turned into pure hatred after 2 miles of my first run. The watch reboots itself every time I run with the MP3 player on. After my 3rd run and 5 reboots I called Timex and they said they are aware of the 1.0.0.3 software issues. They were kind enough to honor their warranty and sent me a new one after I sent my old one back (with an $8.00 bill for return shipping). This morning after I got 3 miles into my run with my new watch it rebooted again. I contacted Timex this morning about a full refund. Has anyone else had this issue? I am having the exact same issue. Watch reboots couple times in first 30 minutes. I am using the music app which is why I bought the watch. My software is 1.0.0.4. So they have not fixed the issue. In addition, I cannot check off headset feedback settings so there is no audible feedback. Sometimes feedback on only vibration is not working. The watch seems to be full of bugs. It doesn’t come close to the Adidas Smart Run. The only part that is better is faster GPS. Had the same exact issues, hah out replaced, spent time with customer service and still rebooted on every single run. Ended up returning it for good and bought a garmin. I really hope they do some serious updates or a second generation because I’d love to have all those features working properly. Yup. Had to return mine as well. Exact same issues (as noted further up in the comments). Picked up an Apple Watch instead. Not sure I love it – and obviously doesn’t free me from carrying my phone, which was my goal. Maybe some day.